Another year is coming to a close, and the quiet holiday time has nearly ended. Mind you it ends in a bit of activity with an evening dinner with friends. Tonight we will talk of vacations, next year plans, have a lamb dinner and watch Boston Legal season one. I’ll get the pans and spoons out for noise making at midnight. New Years day dinner is family time. with 11 or 12 of us, this year I am breaking with tradition and serving spagetti and meatballs. Dessert will be offerings of fruit, cakes, tarts, plum pudding and whipping cream, so one could make a triffle or anything else they desire. The tree will come down on Monday, I am at the point where I want a return to my rather lax routine. http://lenealve.blogspot.com/ post on Small is beautiful is wonderful, her photo of wool and her cat are great, I recommend everyone have a look. Christmas has brought me a ball winder and a swift, that will be a really nice change from sore shoulders and wrists. I went with a friend to http://www.threebagsfull.ca/ over town and picked up my swift, size 2mm needles for socks and the latest Knitscene. Don’t think I will knit anything up from it, it is quite retro and young, there is an interesting fulled mohair wrap, an article on Eunny, and another article on crocheted edges. The 2mm needles are working out much better with my tension, and I am just knitting a plain pair of socks with the garter stitch short row heel. I liked the first pair so much with that heel I am doing it again, of course this time I am doing it correctly! No more little holes on the diagonal, I liked them last time and thought they were a design feature. On Friday I went with another friend to Fabricana and had a lovely look at lots of wonderful fabrics. It is nothing like Fabricland. I bought 4 pieces of fabric for $90. One printed linen, one printed stretch lace, 2 jersey knits one print and one plain. The plan was to buy printed fabric and then base a wardrobe around it, using the colours in the print. So I carefully picked prints that would work with the stash. Of course, there are now 3 distinct colourways going on and I have to make up my mind re patterns and pieces. There is an online group working with fabric and planning an 11 piece wardrobe that works together, at the most I have a potential of about 4 parts for each one. I guess I just have to start somewhere and make it work. I am thinking of resolutions, I like to make ones that are fun. I have a much better chance of success. 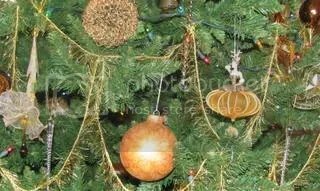 Our tree this year, a large ball covered with silk fibres,and a faun ornament were added to the collection. FO’s The turquoise and carnelian necklace on the left, was made a couple of years ago with beads I had picked up from Sante Fe. A friend gave me freshwater pearls and a tribal style necklace with faux ivory, gold beads and carnelians. 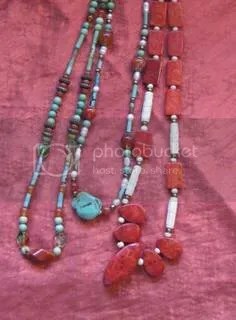 I added the pearls to another group of turquoise and the next strand has some coral from Greece with the faux ivory, there was also some gold beads that I recycled into each necklace as well. I have some more coral to play with but haven’t yet decided, I don’t want it too heavy. The last storm was on the 14th, we did have our power out for 32 hours and it did get down to 54 F in the house. We do have a gas stove so were able to heat water for tea and coffee. No doubt the occasional 24 hours without tv or the internet is good for something, I did get some tidying done without distraction. But on the whole I like to be my choice to give it up tv and not have it forced on me. I wanted to see what was happening in the rest of the community. The uprooting of the trees is terrible, the wind was so strong it actually reached hurricane force out in the Gulf south of Victoria. 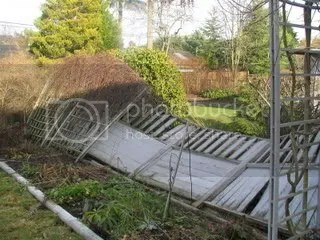 We lost a section of our fence. Knitting slowly progresses, sewing is at a standstill since the storm. Most of the Christmas decorating is done. Only another 20 cards left to do. The doll exhibit has been put up. Most of the shopping is done. 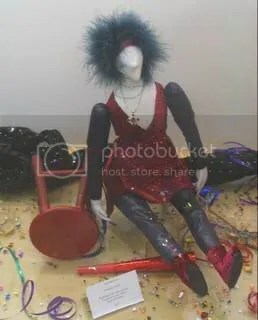 This is mannequin, a creative costume course taught by Adele Scortino, this poor girl has partied a little too hard. 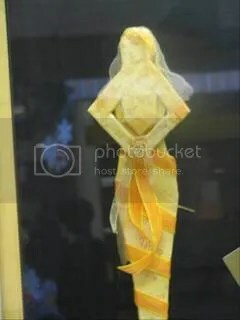 This is golden girl, foamcore, rubber stamped, ribbons and beads. It was hard to photograph the dolls with the glass and the glare from all the lights. I have been reading a lot of blogs regarding sewing clothing and getting the proper fit. It requires adjusting patterns and makig a trial garment known as a muslin. I usually just cut out the tissue pattern, put it up against my body, check in the mirror if it goes around and then hope for the best. I bought a blouse pattern that was labelled how to fit a full bust. So I followed the list. Cut out the tissue pieces, ironed them, put small pieces of scotch tape against necklines, armholes and other curves. It has princess seams, so this took me awhile. Then I remeasured to make sure I was doing the right size and pinned the back together and the front to it at the shoulders. Next phone a neighbour to see how the back fit, it was OK. Now the front, next make sure the bust apex is correctly located, cut out both front pieces in that area, slide the pattern, tape it to a new backing, redraw the seam, try on again, it is better. Next width is tackled, cut along line 3, spread the tissue, add new tissue in the space, tape. cut line 2 spread pattern again, like an additional dart, that makes it longer in one area, tape that, now cut the other piece to even that up, tape it. now cut to the seam allowance and swivel pattern until the new dart cutout is closed again. Redraw the new seam allowance where the cut was just made. That wore me out, the stress and strain required a glass of sherry and a time out to read a few chapters of escapism. Pin it all back together and try on, it looks pretty good. I decided to rest for awhile after that, no wonder I have given up on this process before. It will all be worth the work if the blouse fits. http://urbanyarns.ca/home/home.html Urban yarns is opening a 2nd store in Edgemont Village. It will be so nice to have another yarn store on the North Shore. If only we could get another fabric store as well. Not that I am doing anything with sewing except dreaming about what might be. I did buy fabric this week for a new top but I have to adjust the pattern and make a muslin before I start it. So rather than do that, I am knitting a scarf and a stole. Finishing up 3 dolls to put in an exhibit. I just need to find the case with all my favorite pens and pencils, I have really hidden it well. It must be really safe.